Twenty potato growers from all over the Wisconsin converged on Madison last week for their annual “grill the professors” ritual. They came from Eagle River to Spring Green and Coloma to Plover and grow for fries, chips, fresh market and seed. It’s an eclectic bunch, but they all have one thing in common — they are very good at growing potatoes and are committed to getting even better. Like the best corporations in the U.S., Wisconsin potato growers are pretty sure that the only way to do this and keep the competitive edge they enjoy is to invest in the future — research and development is where the new ideas emerge, and new technologies are hammered into useful tools. To make this happen, growers tax themselves annually to provide a source of funds that can be used to promote potato sales and fund research. It is only 6 cents per 100 pounds of potatoes, which doesn’t sound like a lot. But when you are the third largest producing state in the U.S., with around 62,000 acres averaging almost 45,000 pounds per acre, it adds up fast! As a result, these growers come to Madison every year with over $350,000 to invest in research. They ask University of Wisconsin faculty to present proposals that will move the potato industry forward. Proposals can be applied research to solve today’s problems or basic research that may not bring returns for a decade or more. Basic or applied, proposals are all treated the same- the faculty present ideas and hypotheses and then are questioned by the growers. If it’s good science, then it stands a chance! The faculty members in the biological sciences, who are among the world’s best, respond enthusiastically. This year 27 proposals from 14 UW departments and program areas were submitted, which took growers two days to examine. They will meet again in a month to decide which projects will be funded. The diversity of 2016 proposals was indeed broad and beyond the scope of this blog to include them all. A few examples will provide an idea of what it takes to stay on top in today’s competitive agricultural world. Since potatoes are an irrigated crop, water conservation is the highest priority for the industry. This was reflected in six proposals that included: working with DNR staff to incentivize good irrigation practices; economic impacts of water; bringing water users together to discuss solutions at the local level; maintaining water quality; understanding effects of pumping on surface water in streams and lake sand analyzing groundwater fluctuations in a network of over 600 high capacity wells. We all have our favorite kinds of potatoes — reds, yellows, whites, blues, chips, bakers, mashers — the list seems endless thanks to the Mendelian wizards in the potato breeding field. These gurus presented four proposals to develop new, tasty and interesting new varieties in the years to come. Protecting the potato crop from pests like insects, diseases, weeds and nematodes, an area where Wisconsin growers are already recognized as world leaders, garnered 10 proposals indicating that there will be no slowdown in this area any time soon. Basic research abounded in this year’s proposals with at least 10 proposals using state-of-the-art molecular techniques as tools to develop new varieties faster; understand the role of genes in pest virulence, and examining how pests become resistant to our attempts to control them. Finally, there are the ideas that are unusual but full of promise. Good examples from this year included: developing a natural community workbook to support restoration and conservation of Wisconsin’s natural ecosystems; delving into the mysterious world of soil microbes and soil health to examine how the millions of organisms down there exist together in harmony but sometimes get unbalanced and cause problems and finally, extracting antioxidants from potato peel to supply the increasing demand from the manufacturing and pharmaceutical industries for specialty potato byproducts. This is an amazing assemblage of science and innovation, and Wisconsin’s potato grower support the bulk of it. The potato industry gets no federal handouts or subsidies and is used to forging its own future. So think of this at Thanksgiving this year as you tuck into those delicious mashed potatoes! 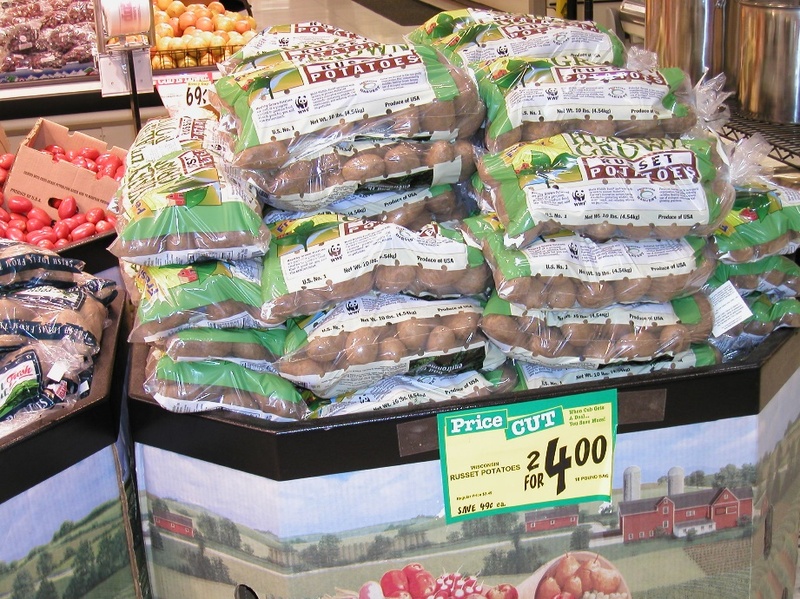 The Wisconsin Potato and Vegetable Growers Association (WPVGA) is working on expanding in-state sales and recognition of Healthy Grown potatoes – certified as ecologically grown, socially responsible, and ecosystem friendly – and they taste great – what a bargain! This promotion was made possible thanks to a grant awarded from the Wisconsin Department of Agriculture Trade and Consumer Protection agency’s “Buy Local, Buy Wisconsin” program. This grant is helping the WPVGA publicize the Wisconsin Healthy Grown program and feature its ecologically grown fresh potatoes, which have put Wisconsin on the leading edge of sustainable potato production.